We offer a full stump removal service. 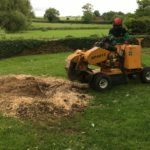 With a wide selection of stump grinding machinery at our disposal we have the ability to remove a large number of stumps, with no upper limit on size, with minimal disruption or fuss. Our wheeled remote controlled stump grinder offers the ability to grind large diameter stumps while causing minimal ground damage and is regularly used on turfed areas without causing turf damage associated with a track machine. 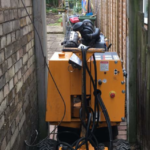 The abili ty to fit through a 29 inch gap means this machine is particularly suited for hard to reach stumps in areas with limited access, offering a level of productivity that cannot be achieved with smaller machines. For the rare occasion that our larger machinery cannot gain access, we can utilise our small handlebar machine. This only needs a 23 inch gap and has been taken through houses when no other form of access is available. This machine runs the same quick change carbide-tipped teeth as our larger machines and has no upper limit on the size of stump it can process. 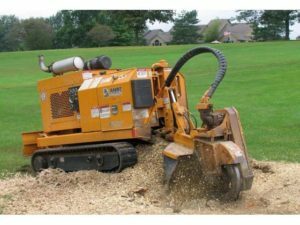 For areas with a large number of stumps, our tracked stump grinder can remove large diameter stumps in minutes and is a cost effective alternative to the traditional excavator grubbing method of stump removal. Stumps are ground into mulch and worked back into the top soil, saving disposal and haulage costs while causing minimal ground disturbance or damage to retained features. 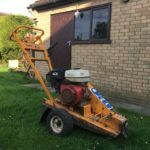 Fitted with non-marking rubber tracks and used with ground protection matts, this machine can also be used to remove large diameter stumps in more sensitive areas where ground disturbance needs to be kept to a minimum.